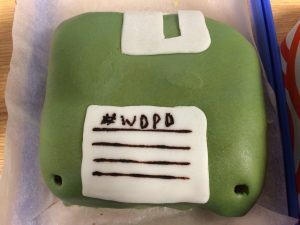 Happy World Digital Preservation Day 2018! 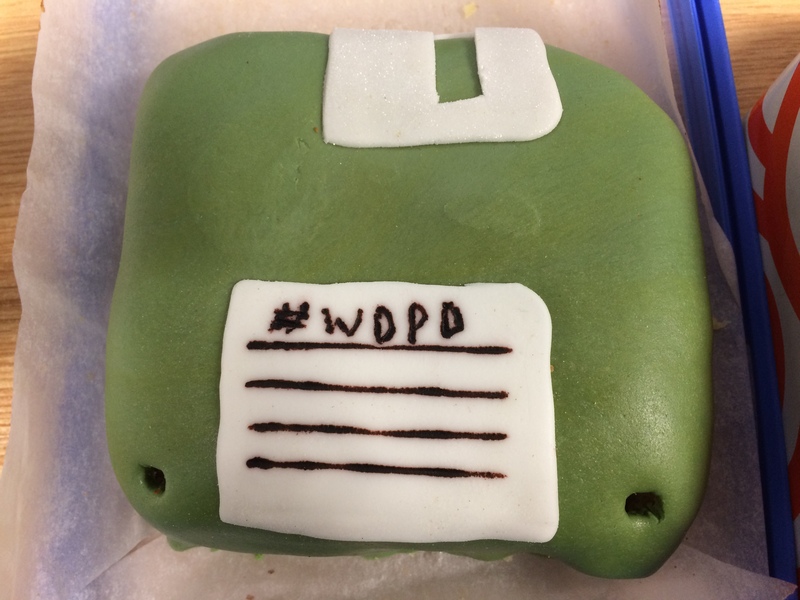 I seem to be blogging on a theme of particular days here so far – but in case you hadn’t already guessed from the title, today is World Digital Preservation Day! I thought it would be a good excuse to talk a little about the challenges we face in terms of making sure we can access the records of the University of 2118, as easily we have been able to look back at those which record the founding of the University while preparing for our centenary. The most striking difference is probably that the paper documents and annual reports of the 1910s and 1920s are on a pretty stable, human readable format: paper. The printed or handwritten characters, or images, don’t usually need any form of interface to read (maybe a magnifying glass, if the print is very small, or a dictionary for unfamiliar words). 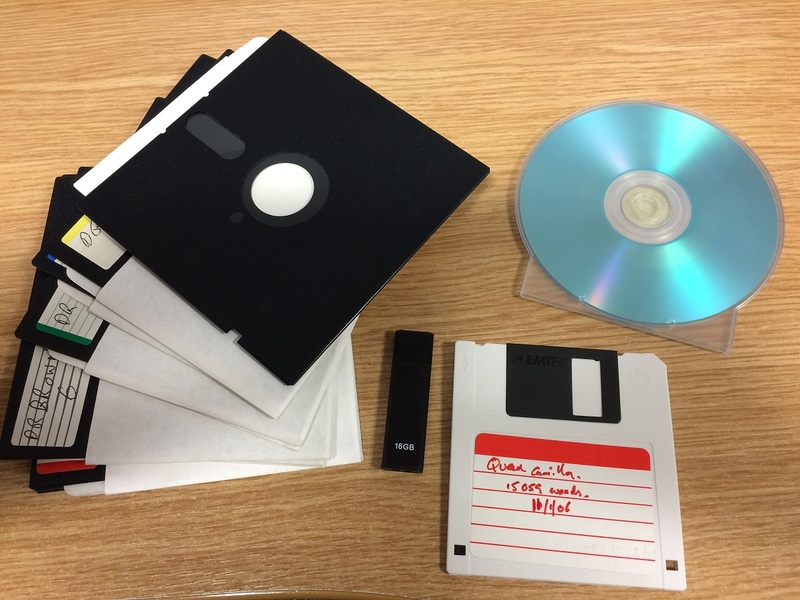 When faced with something like the examples in the photograph below (from left to right, 8 inch floppy disc from the Leicester Medical Society collection, a data stick, a 3 1/2 inch floppy disc from the Sue Townsend Archive, and a CD), we need to do a few things to even work out what is on them, and how we can read the files. Some as you can see, have labels which give us a clue as to what they may hold, or who owned them, but most don’t tell you what format they are or what you need to do to be able to read them or get the information off them – you can’t really learn anything from just looking at them. If you have the wrong kind of software or a newer or older version than the file is written in, you might end up with an error message and be unable to open the file. Worse, if the file has been corrupted (bits have been lost meaning that it is impossible to show the data in a meaningful form), you may not ever be able to recover the data. You may have trouble even getting to this stage – who has recently tried to locate a machine that has a CD drive, let alone a floppy disc drive, before giving it up as a bad job (maybe just us then….!)? Luckily for us with these examples, the material on the 8″ floppy discs had been migrated to newer formats and has been imported into the main library catalogue, and it is still possible to get hold of external 3 1/2″floppy disc drives, so we should still be able to access anything coming in to us on disc if it is the only copy. As mentioned in my previous post, we collect and save records of the University, to comply with laws requiring us to keep and be able to access them for various periods of time, to record decisions made and actions taken, and for general interest in what the University and its staff, students and visitors have been doing over time. We are pretty good at identifying, collecting and preserving paper records, but what are we doing to try to ensure that we don’t loose any information to the ‘digital black hole’? Over the last 12 months, members of the archives and special collections team, along with colleagues from the research data management team and the records manager, have been doing an online course in basic digital preservation. This has taken us through the concepts and theories and the need for various policies and procedures to support digital preservation activity, to risk assessments, demonstrations of the kinds of tools you can use for various tasks, and given us lots of examples and case studies to read about. For archives and records management a lot of the concepts and processes are familiar, it’s just how to do them for digital records which poses more of an issue. It will certainly require a lot of team work, with our wider colleagues in IT for example, and with people wishing to deposit digital material with us. Our RDM colleagues have forged ahead with procuring a repository (Arkivum) and front-end (Figshare) for research data and its outputs – see here http://gradschoolreadingroom.blogspot.com/2018/09/introducing-university-of-leicester.html and here https://leicester.figshare.com/ for more information (or to browse the data! ), but in archives and special collections, we are still very much at the beginning of the process.